The headline says it all. If you queried about a Big Idea for September and I have not yet gotten back to you, everything is all filled up for the month. October and November slots are still open (for October and November releases). Such is the latent influence of A Christmas Story that whenever I see a box marked “Fragile” my brain pronounces it fra-gee-lay, and another part of my brain says “It’s a major award!” But in today, the box marked “fragile” that came to my house did have a major award in it: the Audie that The Dispatcher won this year. 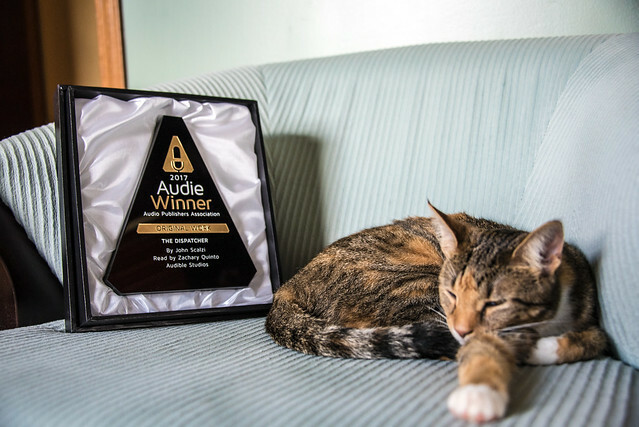 The Audies, in case you were not aware, are the awards that the audiobook industry give out, and this year The Dispatcher was a finalist in three categories, and won in “Original Work,” meaning a production that was designed from the ground up to be an audiobook. I showed the Audie to Spice, as you can see; she was not notably impressed, but then, she’s a cat. The Audie will not stay on the chair any longer than the cat will; it will go on the award shelf along with the Hugos and Locus and other various awards. 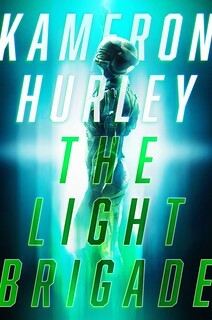 I’m delighted to have the physical trophy because I’m proud of The Dispatcher, not only in terms of what I wrote, but how it was brought to life by Zachary Quinto and the folks at Audible. It’s nice to have a tangible reminder that the whole package was appreciated by listeners and industry peers. Thanks, folks. California has always been pegged as the “weird” state — and as a native of the state, I just have to say… well, yeah. 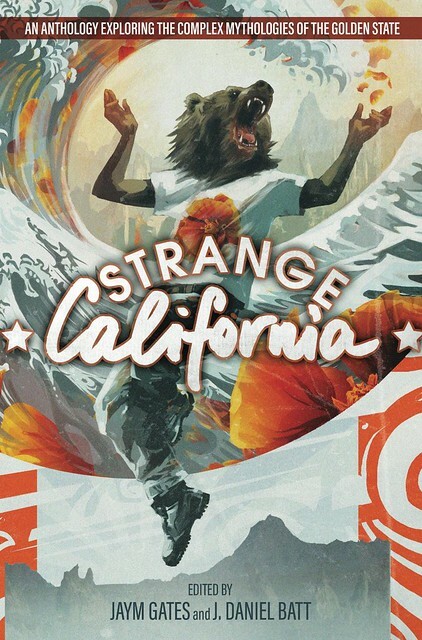 But in Strange California, the story anthology she’s co-edited with J. Daniel Batt, editor Jaym Gates goes beyond a simple agreement on the strangeness of the state, to dig into what makes the Golden State so weird and wonderful. I think I first came up with the idea for Strange California long before I realized it. I had a habit, when I lived in the state, of taking long drives, losing myself on backroads choked with fog, warded by towering oaks or sequoia. One day, on my birthday, I was driving up Highway 1, along the coast from Santa Cruz to Pescadero. It was a sunny day, but a wall of fog was rolling in from the sea. Highway 1 is all steep cliffs and blind corners, and as I drove around one such corner, I found myself surrounded by a lemon-yellow fog. There’s no way to describe that color or feeling in words. It was like being swallowed by the sun, glowing and liquid in a way I’ve never seen before. I wanted to stop and bask, but I passed around another corner and was again in the grey and blue and gold of early-winter California, wondering if I had dreamed the whole thing, and suddenly I was laughing, the fear and stress of months of personal horror washed away by a strange trick of the light. It was moments like these that inspired the title of this anthology, and the spirit of it. The roads of California are entities themselves, mythologized in their own right, and they play their own part in telling the stories here. Take a journey up Highway 99. Stop off just north of Bakersfield where a young woman stands on the edge of Woollomes Avenue, looking apprehensive, debating if she should cross. She’s been dead for decades but the residents see her often enough that she’s become a stable fixture of the scenery, as normal as the billboards that line the Highway. Follow that highway further and you’ll encounter another roadside obscurity. John Muir’s conservationist efforts have inspired people across the world. Commemorating him via celebration wasn’t enough for the small town of Lemon Cove. To honor the champion of the wilderness, some Californians have constructed a massive wooden sculpture of his head that sits just the road, staring to the horizon, to the vastness of Yosemite. Time for one more stop on your trek up 99? How about visiting the underground city below Old Sacramento buried when the town decided to simply raise the roads and start fresh. The storefronts still stand and some swear that the dead have migrated to roam the alleyways of a town that’s been forgotten by the tourists walking above. You have a choice, from here. On up 99, to the brutally-sharp rubble and claustrophobic caves of the Lava Beds National Monument, to the silent, deserted ghost towns and high-mountain deserts of Modoc, the extinct volcanoes and wildlands around Lassen. Head back around to 80, through the Donner Pass–be sure to go in winter, and take some friends with you. Or you can leave 99 and take 50. 50, the notorious mountain highway. Blocked in winter by snow, in spring by mudslides, in summer and autumn by wildfires. Stop off in Placerville, where an effigy still hangs over Main Street in commemoration of its heritage as Old Hangtown, and ghosts are reported in nearly every old building and mine. Follow 50 through the steep climb to Tahoe, the legendary inland sea, or venture off to its tributaries 395 and 49. 395, passing through military training grounds, ski resorts, cattle towns, and back down into the deadly beauty of Death Valley and Yosemite. 49, the Golden Chain highway, snaking through towns once infamous for their gold and hangings, through the country that inspired Mark Twain and Clark Ashton Smith. And we haven’t even touched on Southern California, or the intense rivalries between North and South. With an economy rivaling that of many world nations, it is a world unto itself, full of mystery and legend from a hundred cultures and alternate histories. It leaves an indelible mark on everyone who passes through it. But these are strange places we know of. California sprawls across a multitude of landscapes and has amassed a history full of the strange and unusual. There are secrets in the desert. Secrets in the cities. Strange and unusual happenings in the odd, dark places of the coastal state. I’ve wanted to do a project like this for a long time. My family was in the state before it was a state, and the family stories would fill many a night of storytelling. While that history influenced my own storytelling quite a bit, I wanted to hear other stories, too. So J. Daniel Batt and I talked to some people, opened a slush pile, and built an anthology. We ran it off of Kickstarter (and discovered just how much Facebook throttles links now! ), and barely funded. In true California fashion, we met our goal in the 11th hour…thanks to a mysterious venture capitalist. It was the perfect laugh, a thing where you shrug and remember that weirdness doesn’t stay in the soil of a place. California is an entity, a genius loci of power and mystery. It inspires envy, lust, greed, love, fear, and so much more. Its wide borders encompass a microcosm of the nation, from abject poverty to unimaginable wealth, the old ways and the new packed shoulder-to-shoulder, simmering with potential for greatness, or for disaster. 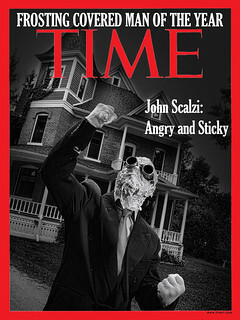 California Strange tells a few stories inspired by that legendary place. Read an excerpt. Visit the book site. Follow Jaym Gates on Twitter.